Vis it us online www.Grani teLofts.com or call 617-733-8914. Granite Lofts provides a unique open floor plan style of living in a small city setting conveniently located near the North Quincy Red Line "T" station, stores, restaurants, post office, banks, library and grocery store. Situated on a almost 2 acre site and encompassing an entire city block, Granite Lofts condominiums are comprised of two separate buildings on the east and west ends of the site separated by a landscaped courtyard. Off street parking is included and garage parking is available at an additional amount. Starting at $299,000... Styles available: 1 Bedroom, 2 Bedroom Stainless steel kitchen appliances, granite counters, bamboo or polish concrete flooring, in unit laundry hookups, central air, ceiling fans, large windows, and elevator. Most units have 2 full baths A major supermarket, pharmacy, video store, banks, a classic diner and U.S. Post Office are all within sight of the development. 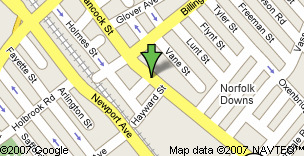 In addition, the North Quincy Red-Line MBTA station, at the end of Holmes Street, is only a 3 minute walk. Additional stores and services such as restaurants, dry cleaners, a hardware store and coffee shops can be found within a short walk. Loft residences have long been known for their open floor plans and flexible spaces. However, many loft developments don’t deliver “completeness” of the homes when it comes to finishes – commonly offering only a one-room, multi-functioning living space, a single lavatory, little closet space and the most basic kitchen and bathroom finishes. Buyers of those type ‘lofts’ are often faced with the arduous and expensive task of upgrading the basic finishes and attempting to create some type of more private sleeping and living areas within one open space. From the early planning stages, the vision has been to bridge the gap between ‘open loft’ living and more complete, move-in ready residences. Granite Lofts delivers the best of both worlds. Each residence provides open, voluminous living space highlighted by dramatically high ceilings with exposed wood beams and wood decking. The expansive anodized, aluminum framed windows create stunning walls of glass. European-style kitchens are finished with both wood and metal-framed, frosted glass cabinet doors, granite counter tops, a free-standing island with overhang for seating, stainless appliances and low-voltage pendant lighting. Many of the bedrooms offer walk-in closets and bathrooms en-suite. 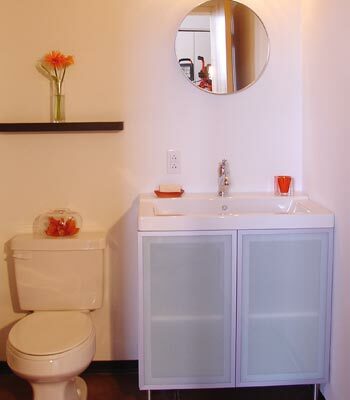 The bathrooms feature a European-style vanity cabinet and sink on stainless steel legs, clean, white subway-style tile on shower/tub walls, low-voltage lighting and natural wood decking for a truly unique ceiling treatment. The sleek concrete floor system is stained and sealed in a warm ‘cola’ color, providing a smooth, continuous surface throughout. On-site parking for each residence offers yet another convenience, giving residents the ability to drive to their destination and arrive home to guaranteed parking. 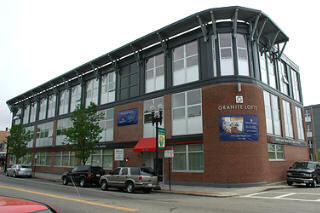 Granite Lofts offer you the best of all worlds. and investment firm with offices in Boston and on the South Shore. 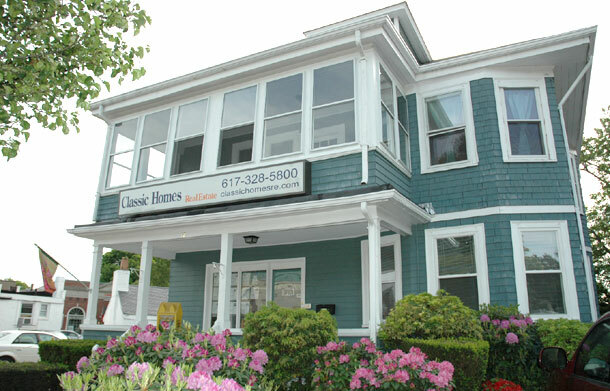 New England, as well as many office, hotel, and retail properties in the region. In fact, the firm has developed and incorporated over one thousand residential units through the rehabilitation and re-use of mill-type and older properties alone. The Heritage Companies commitment to quality is shown in all forms of the firm’s vast array of residential product type, from 300-unit residential properties to some of the highest-end residential properties in the Back Bay and Beacon Hill areas of Boston. The Heritage Companies brings to each and every one of its projects a wealth of development experience in both new and rehabilitated buildings, financial strength and a commitment to delivering quality and value to its customers. Founded in 1981, Metric Construction is an experienced general contractor equally adept at creating cutting edge designs and historically accurate renovation. Its quality construction can be found in Boston’s Back Bay, Beacon Hill and South End neighborhoods. areas. These developments include Spencer Lofts in Chelsea, a 100 unit loft conversion, and Porter 156, a 217 unit loft conversion in East Boston. Marine Waterfront Residential /Commercial Mixed Use Development, Free-standing, Single-family and Duplex residences, to master-planning Age-Directed, over 55, residential living communities of 100 homes and more. These projects are located in many parts of New England including Boston, Quincy, North and South Shores, Cape Cod, Western Massachusetts, Maine, New Hampshire, Connecticut and Rhode Island. *Developer reserves the right to replace any of these items with those of equal or greater value. on walls, semi-gloss on door frame. Vanity/Sink- IKEA Vattern / Ommen vanity with Hollviken Sink. what is commonly referred to in Massachusetts as the "South Shore," which extends along the coast down to Cape Cod. However, it is more frequently viewed as a medium-sized city within the Boston metropolitan region. Quincy has approximately 27 miles of coastline that is enveloped by two natural peninsulas that border Quincy Bay. The land area of the City is approximately 17 square miles. followed in his footsteps and attained the presidency, and following his tenure he became regarded by many as the finest diplomat in the Foreign Service Corps. The Adams were but one of many prominent and influential families residing in Quincy during the colonial years and thereafter. During its early history Quincy was an agricultural community, similar to many of its neighboring towns. The early advent of industry in the area gave rise to some of the first grist mills and iron furnaces in the country. Despite its proximity to the ocean, early on Quincy's commerce was largely geared toward the exploitation of terrestrial resources. transportation technologies, such as the rail track switch, the rail car turntable, and the swivel trucked rail car, led to Quincy's eventual development as a major industrial shipbuilding center engaged in global trade. location, excellent transportation facilities and numerous amenities. commercial, residential, and retail growth. You are being provided with similar access that real estate professionals receive. We must validate your information because of the confidential and private information you will have access to. Competitors will be denied access, as well as those who provide fraudulent information. The material within the site is unique, highly proprietary and a trade secret. This is a no cost, no obligation service. Your information is held in the strictest confidence and will never be sold or given away. Find the BEST condos that match your needs!